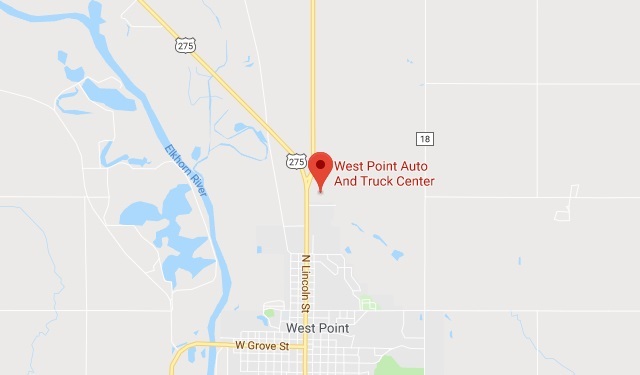 West Point Auto & Truck Center, Inc. | Sioux Falls, SD | North American Truck & Trailer, Inc.
West Point Auto & Truck Center, Inc.
West Point Auto & Truck Center is a proud member of the North American Truck & Trailer chain. Whether you're searching for a light, medium or heavy duty truck, SUV, passenger vehicle, we have what you need! We carry Ford Commercial, Ford, Chevy and Buick passenger vehicles, SUV's and trucks. Expect the best service AFTER the sale as well. Our certified techs are fully equipped to handle all your Ford, Cummins and Volvo engines as well as other makes and models. Looking to improve the efficiency of your cattle feeding operation? West Point Auto & Truck Center is now a JayLor Feed Mixer dealer. Now stocking new and used mixers. We also sell Nitro Manure Spreaders, McHale Balers and Richiger Grain Bagging Systems. For the finest quality farming equipment, turn to us!